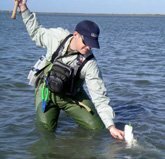 The Gotcha Fly is one of the most successful bonefish flies ever created. It imitates a small shrimp very well, and utilizes the subtle action of craft fur and the signature pink nose. 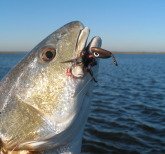 There is an interesting story behind it, the name is catchy, and it was an easy decision to use this pattern as the inspiration for an effective Bugg for the Gulf Coast. Keep reading to learn more! 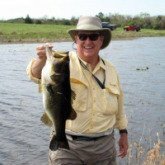 The story goes that Jim McVay, an avid fly fisher, tied this fly using carpet clippings from a cab he was riding to the Andros Island Bonefish Club. After fishing it with tremendous success, he and his son Ted modified the fly using craft fur for the wing. 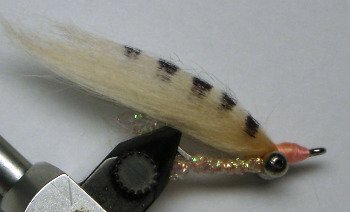 The craft fur gives it subtle movement, and the colors and action of the fly make it an excellent small shrimp imitation. Bonefish love small shrimp, and it's easy to understand why they love the Gotcha Fly! According to Jim, credit for the name goes to Rupert Leadon, an Andros Island Bonefish Club guide, who exclaimed "Gotcha!" every time a fish took the fly. I can vouch for it's effectiveness on Andros Island Bonefish as my first bonefish was caught on this very fly. The pale pink and tan coloration makes for a killer bonefish fly, and as we've learned a killer redfish lure as well. The example above was tied with craft fur that was then barred to suggest the segmentations on a shrimp. The bead chain eyes provide a small amount of weight, and their placement on the underside of the hook shank keeps the hook point up as it sinks to the bottom. 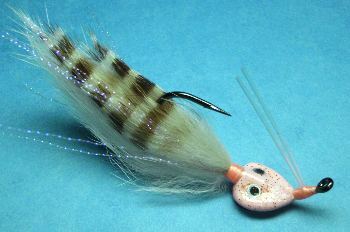 The craft fur wing is long enough to give it movement, and the tan braid provides a subtle flash on the body of the fly. It doesn't take much imagination to understand how this color combination would work very well for Redfish. We use the Flats Bugg head, designed to land hook point up and rest upright along the bottom, the same as the bead chain on the fly. The head is pink, and the tan bunny is barred on top and plain on the bottom. We've added some subtle flash along the sides, culminating in a killer shrimp pattern to fool redfish, speckled trout, and flounder along the Gulf Coast and beyond. Tied Like Flies, Fished Like Lures! This is a perfect example of our company goals in action. Bonefish flies are a terrific source of inspiration. Bonefish and Redfish are practically cousins, both having an inferior mouth (mounted on the bottom of their heads) and both cruising shallow flats looking along the bottom for shrimp, crabs, and small baitfish to devour. Look for the Gotcha Bugg in the Buggs Fishing Store. We hope you've enjoyed the story of the Gotcha Fly and hope you'll try it out on your next bonefishing adventure. And the next time you're fishing in shallow water along the Gulf Coast, we hope you'll tie on a Gotcha Bugg and experience the effectiveness of this pattern for Redfish, Flounder, and Speckled Trout.